In California, and in the Bay Area in particular, it is becoming increasingly difficult to find railroad scenes uncluttered by development. By their very nature, railroads attract civilization along with devices used to discourage their interaction with the general public -- most notably fences and walls. Because of this, it is all the more rewarding to find a place where trains still roam through the unspoiled landscape. Orwood, situated in the California Delta region along the Old River, is one such place. Orwood is an oasis of farmland, cattails, wild creatures and solitude. Apart from Cruiser Haven Marina, which is largely shrouded from view by trees and brambles, it is all but ignored by people. An ideal spot for an afternoon of railfanning. We come here often during summer afternoons to watch the parade of freight trains and passenger runs. Atop the levee road you can see Mount Diablo to the west and the Orwood drawbridge to the east. The siding here is heavily used by trains from both directions. 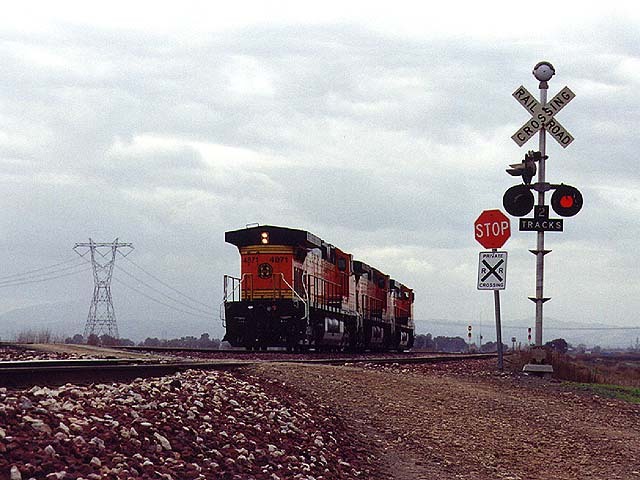 A westbound unit steel coil train pauses at Orwood siding in April 1998 while waiting for eastbound hotshot freights and Amtrak's San Joaquin Train 716. It was extremely cold and windy this afternoon, so Benji and I took shelter in my car for our two-hour visit. Photo by Glenn Gehlke. The rosy glow of a postcard-perfect California sunset is refelcted in the metal sides of a string of intermodal trailers bound for the Bay Area in this shot taken in October 1998. Photo by Glenn Gehlke. If you chase enough trains eventually the railroad throws you a bone. 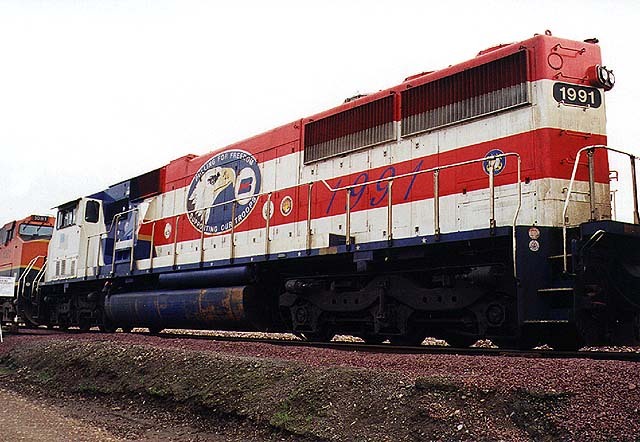 Ours came in the form of this Burlington Northern SD60M, road number 1991, which BNSF's predecessor painted in patriotic colors to honor the soldiers of Operation Desert Storm. 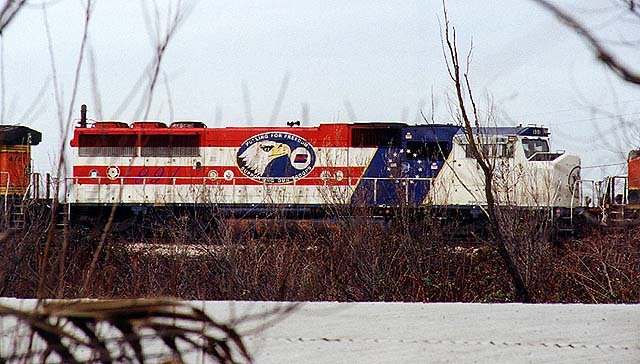 By chance, we spotted this locomotive one afternoon in mid-January 1999 as it sped through Oakley as part of an intermodal train bound for Stockton. Fortunately, it got flagged into the siding at Orwood in favor of four westbounds, allowing us plenty of time to catch up to it and stake out some photos. This one was our first, taken from across Old River at Cruiser Haven Marina. Photo by Roni Gehlke. Frustrated by our obstructed view, we headed back on Orwood Road to the private crossing just before the Orwood railroad drawbridge. Crossing to the opposite side and using the dirt access road allowed us to get right alongside our prize. Here we see the front left side of the cab. Photo by Roni Gehlke. Another shot of BN 1991, this time of the left rear. While we were shooting, several BNSF maintenance of way workmen passed us and we expected they would probably ask us to leave, seeing as how we were trespassing on their access road and partially blocking their way. However, they smiled and let us continue. I think they understood why we were there and why this particular locomotive had attracted us. Photo by Roni Gehlke. 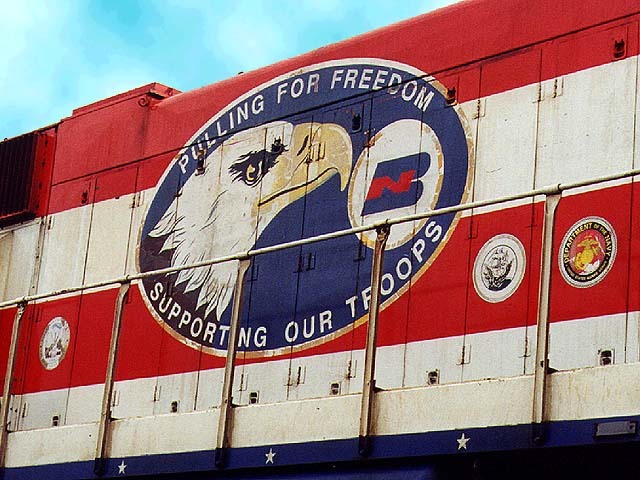 Here is a closeup of the bald eagle logo and the military insignia. The words printed on the herald read, "Pulling for freedom. Supporting our troops." We tired of the bland sky in this series of photos so broke the rules in this instance and Photoshopped in a few clouds against a relaxing blue sky. Photo by Roni Gehlke. 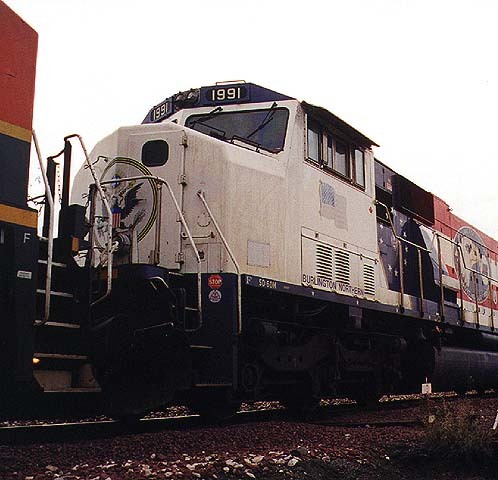 As we were turning to leave following our photo session with BN 1991, we were stopped by the flashing lights at the private crossing and greeted by a trio of light engines in the BNSF Heritage paint scheme. 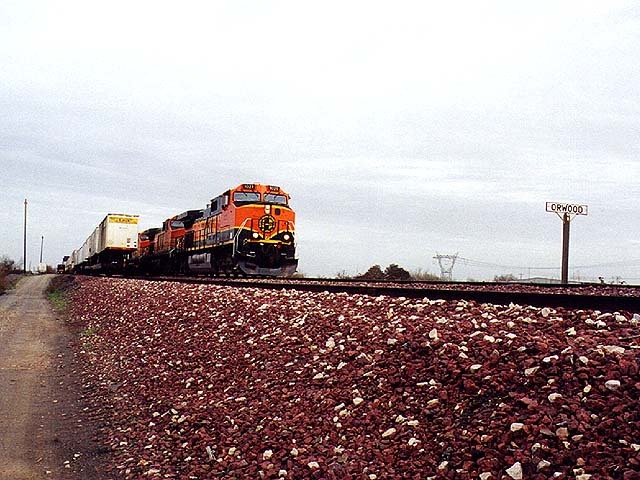 BNSF 1021 was on the point as the consist clattered over the steel drawbridge and continued west. Photo by Roni Gehlke. Just as quickly as they arrived, the locomotives pass us and we are watching BNSF 4871's tail as they disappear down the mainline. Glenn is nearly late for work, so we're on our way home as well. Photo by Roni Gehlke. We welcome your comments and suggestions. Please send e-mail to Glenn or Roni Gehlke. Proceed to Milepost 1147.2 on main track. Hold main track at last named point. Over. This page was last updated Wednesday, August 4, 1999 at 00:05 hrs.